The town of Whitby is a fishing port on the North Eastern Yorkshire coast. 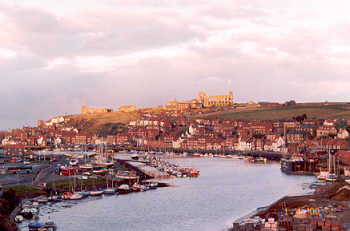 Famous for its associations with Captain Cook as well as Bram Stoker's Gothic Horror "Dracula", Whitby is a popular destination for tourists visiting the North York Moors and the Yorkshire Coast. Popular Dracula related attractions in Whitby include St. Mary's Church and Whitby Abbey (both of which feature in the novel, and can be reached by a steep climb up steps from the harbour). Twice a year Whitby hosts the famous Whitby Goth Weekend - when "goths" and other fans of gothic horror gather to celebrate Bram Stoker and the area's infamous Dracula connections.